Prati Palai is a 16th-century farmhouse on a hillside on the eastern shore of the Garda Lake. Rooms are painted in pastel hues and feature attractive wooden fittings, some designed by local craftsmen. There is an inviting swimming pool placed among olive groves and fruit trees that look out over the lake, and bikes are available for rent. The style is farmhouse chic. Interiors are furnished with a mélange of antiques and tailor-made fittings designed by local artisans and some pieces were acquired at local flea markets. Rooms are painted in mellow hues, while communal areas and bathrooms feature wine-red oxide floors. With only eight rooms (five junior suites, three suites), the atmosphere is intimate; staying here feels more like being a guest at a private home rather than a hotel. Prati Palai is part of a farm with properties in the plain of Verona and Garda Lake. The property estate of two lands named Colombarone and Vignol, that were once used in the service of the main villa and have now been turned into eighteen hectares of woodland, gardens, cultivations and olives groves, each one with a wonderful view on the lake. The Italian lake are unlike anywhere else in the world. Surrounded by lush countryside, dotted with local vineyards, drenched in sun and mirrored with the glassy blue water of the Garda Lake. Lakeside life moves slowly, there is time to soak in the beauty of your surroundings and indulge in the finer things. The philosophy that guided the design choices of the restoration was to keep the and peculiarities of the original building unalterated: in order to requalify and enhance this former country house, a time of sharecropping service, through the techniques and finishes of the tradition. The structure includes eight charming suites located on three levels; on the ground floor there are the reception, a reading/living room, a breakfast/dining room and some service areas such as the kitchen and th pantry. The interiors are designed in close relation to the context and the outdoor spaces. No modern materials are in contrast with the poetry of the historical background, since it has been chosen to enhance and enrich the intervention through the honesty of the original construction elements of the Veneto countryside. Ancient wooden planks were chosen for the floors of the suites, colored concrete for other environments, with paint finishes based on lime and enriched with lands or natural oxides embellish the wooden floors and walls. The modest but refined interior aesthetic show respectful renovation and the carefully selected furniture creates a classic, relaxed Italian style. 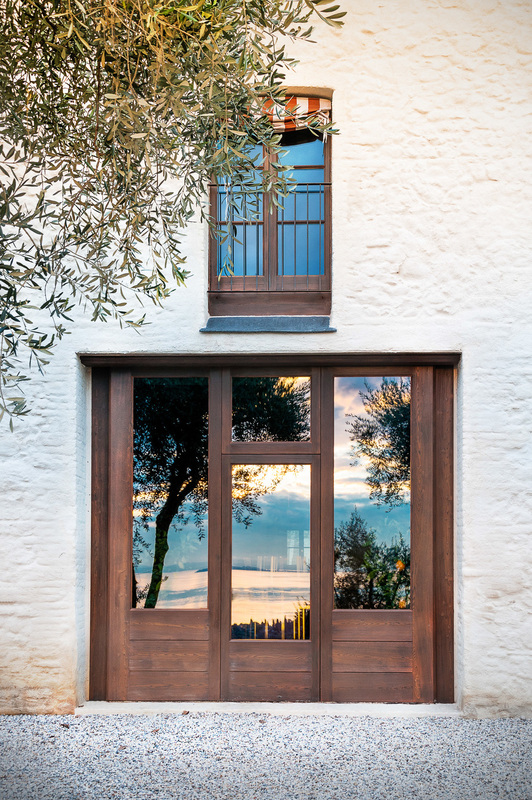 The doors and the windows, realised using artisan methods in larch wood with a particular burnt-brushed finish, are designed according to the space and room sizes in order to perfectly blend with the formal balance of the facades. Various types of frames were designed: double door, the reassessment of the purely classical bow window aperture with special transom, the bilobed etc. The apertures thus become the frame of a painting depicting wide views of the Garda Lake and, in particular, of Punta San Vigilio and of the natural landscape that surrounds the building. The arrangement of outdoor spaces was designed as if nature itself guided the hand of the artist. Flounces grassy paths connected by dirt or gravel arise from the revaluation of the matrix of the design of the countryside in terraces. Guests of Prati Palai are surrounded by nature and can enjoy the countryside pausing into "natural rooms" equipped with fine chairs and tables. A fish pond, fed by a steady stream of water flowing underground, rounds off the unspoilt landscape around the building. A path protected by two grassy ruffles develops among the green of the olive trees and natural essences, leading to the pool area: a stretch of water bordered by an edge of white local stone, and immersed in the countryside, surrounded by foliage and flowers, is the ideal place to relax and enjoy the stunning view of the Garda Lake. The finish chromaticism of the pool was obtained as a result of numerous color proofs that led to the reproduction of the same colors and shades characteristics of the lake basin. Agrinet Snc di Gino Benincà e C.
Largo Carlo Caldera 11, 37122, Verona.